This is some questions/ activities to go along with two movies, October Sky and Apollo 13. October Sky is the story of the expanding American space program through the eyes of a teenager in rural West Virginia. Starting with the launch of Sputnik, this movie chronicles the life of Homer Hickum as he works toward becoming a scientist at NASA. Apollo 13 is a film based on the heroic efforts of the Apollo 13 crew of astronauts and the perils that they face while attempting to land on the Moon. Students will describe the effects of Sputnik on the "space race" in the US. 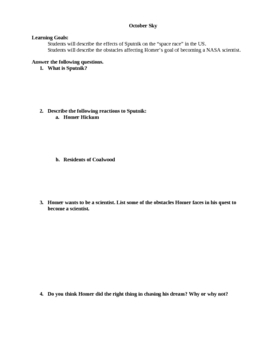 Students will describe the obstacles affecting Homer's goal of becoming a NASA scientist. Learning objectives for Apollo 13:will describe the overall goals and objectives of the Apollo 13 mission to the Moon. 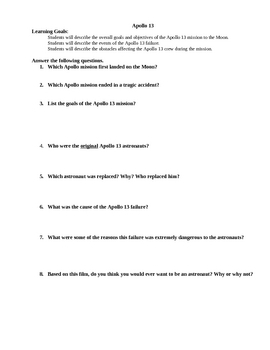 Students will describe the events of the Apollo 13 failure. Students will describe the obstacles affecting the Apollo 13 crew during the mission.